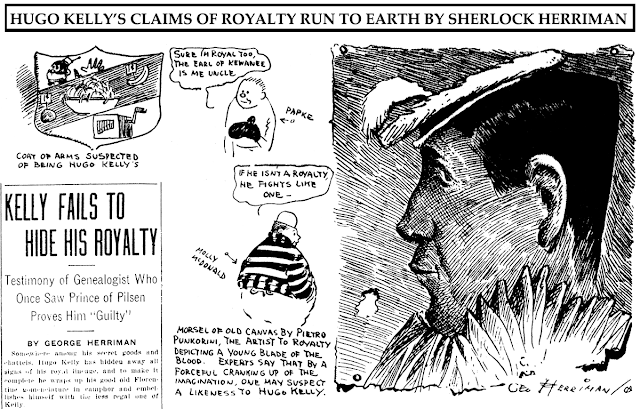 December 14, 1908 -- Whether boxer Hugo Kelly actually made some claim to royal blood, or Herriman is just ribbing him for his odd mix of Irish name versus Italian heritage, I don't know. Not enough of the page left to say. But we have here another example of Herriman at the typewriter as well as the drawing board. I only wish I had the entire text to share with you. 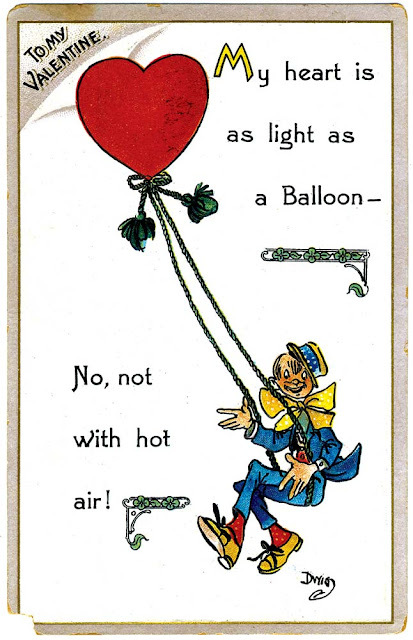 This postcard is from (according to the divided back) Valentine Post Card Series #402, and printed in Germany. Clare Victor "Dwig" Dwiggins is the artist. The maker (or printer) is uncredited except through a logo -- a letter 'G' inside a rectangular artist's palette. Update: Evan Schad tells me that the logo represents "Samuel Gabriel and Sons, a New York publisher who also published a Leap Year series by the same artist." Thanks Evan! Why don't you show the backs to these cards? As a long time deltiologist, this would be of interest and would offer more information. E B Sullivan "Sullie" made Cartoon Christmas Cards and printed them on U S post cards for his own use for several years. They were designed to deal with current events. I have several of them. As I said at the beginning of this series, these are old scans I made years ago, and I don't currently have access to the cards to scan the reverses. Luckily at the time I made a few notes about the reverses so I can at least offer the basic data on them. This looks to me, as many of this era's postcards do, like a bad tracing or copy of the art which was originally printed somewhere, possibly in a newspaper! That's my story and I'm sticking to it. Dwig never drew this sloppily and imprecisely. Marshall “Bud” Sauers was born in Eau Claire, Wisconsin, on May 31, 1906, according to the Wisconsin birth index at Ancestry.com. His middle name was “Clifferd” and parents were Frank C. Sauers and Julie Peterson. The 1910 U.S. Federal Census recorded Sauers as the fourth of five children whose father was a machine tender at a sulfite mill. The family resided in Eau Claire at 615 Forest Street. The same address was in the 1920 census. Specific information about Sauers’s education and art training has not been found. Sometime after the census Sauers moved from Eau Claire. According to the 1930 census, Sauers was a Des Moines, Iowa resident at 939 Nineteenth Street. His occupation was newspaper artist. The census recorded his middle name initial as E. The 1930 Des Moines city directory listed Sauers as an artist with The Register & Tribune newspaper. His address was 756 16th Street. Sauers’s early responsibilities at the newspaper were described in Editorial Cartooning (1949). One of the outstanding young artists in the field of cartography is Bud Sauers, staff artist for the Des Moines Register and Tribune. Bud started out dressing up charts and graphs with bits of cartooning to arrest the eye of the reader. He developed more and more into the field until he now handles full sized cartograph maps on any subject. If the paper carries a feature story on India, the chances are that Bud will be called upon to do a cartograph on that country, showing in cartooned pictures what the terrain is like, what some of India’s chief products are, the natural resources, the animal life, and anything else which might dress up the map, and interest the reader. Bud’s approach in tackling an animated map is o start with a base map from the morgue. He studies the area of the map he is to draw, and looks over any aerial photos that might be available. The research is usually left to a person from another department, since the actual drawing of charts, maps, diagrams, etc., consumes his full time. If it is to be a map showing the natural resources of an area, or the native animals, or simply the various crops raised in the country, his researcher supplies him with all the necessary material. Bud works up in pencil a large scale map showing everything that has been compiled for him, fitting in all the facts and figures where they belong. When this is completed, he goes over the entire map to see how it looks artistically. Alterations are made here and there, if necessary, and when the layout is pronounced complete, it is ready to be inked. American Newspaper Comics (2012) said Sauers was one of five artists to draw Iowa Oddities for the Register & Tribune. Sauers was the first artist whose run started January 12, 1936 and ended February 28, 1937. He did a filler on November 10, 1940 during Ken Eaton’s run. The other artists were Gene Cannoy, Henry Landgren and Tom Swaja. The 1938 Des Moines city directory said Sauers was the department foreman. He and his wife, Irene, lived at 3822 Columbia Street. The listing included his middle name initial, E.
The same address was in the 1940 census which said Sauers’s occupation was art department manager. The census said he had completed three years of college. However, Sauers’s World War II enlistment record said he had one year of college. Sauers, an advertising agent, enlisted December 28, 1942. The Iowa World War II service record said he was in active duty from January 4, 1943 to December 12, 1944. Sauers served in the “217 CAA”, “217 AA Group” and “1688th Engineers”. After the war, Sauers’s entry in 1946 Des Moines city directory said he was an artist who lived with his wife, a clerk, at 1342 30th Street. Both were employed at the Register & Tribune. In 1954 the couple’s address was 2425 50th Street. Sauers passed away August 19, 1990, in his hometown, Eau Claire, according to the Wisconsin death index. Sauers death was reported in the Register, August 22, 1990. Marshall “Bud” Sauers, 84, of Eau Claire, Wis., formerly of Des Moines, died of a heart ailment Sunday at an Eau Claire nursing home. Services will be at 11 a.m. Thursday at First Lutheran Church in Eau Claire, with burial at Lutheran Church Cemetery. Mr. Sauers was born in Eau Claire and lived in Des Moines for 41 years. He retired as chief editorial artist for The Des Moines Register, and moved to Eau Claire in 1971. He was an Army veteran of World War II. Survivors include his wife, Irene; and a brother, Glenn Sauers, and two sisters, Bernice Sauers and Lucille Quick, all of Eau Claire. Lenmark-Gomsrud Funeral Home in Eau Claire is handling arrangements. I can across some very interesting character sketches dating back to the early 1900's and could be connected to a famous person of whom I would like to discuss. If interested, can you email me at cnodland@mobiusexhibits.com if interested in discussing please. Whoops....not Jeanette...my great-aunt, Irene. Bud did come from a family of five...born and raised in EC. Thanks again for recognizing his talent! And my great-uncle Bud, was also known in the family as being quite the jokester! Growing up myself, I loved visiting with him...he moved back to Eau Claire soon after my great-aunt Irene passed away from a heart attack. I have so many pictures of Bud...and a couple of him working for The Register! Great family heirlooms for me! Thank you again for doing this piece on Buddy. His father was Frank Charles and mother, Julia Sauer. And the interesting piece about their last name is that all four of Bud's siblings signed their last name as "Sauer" but Buddy always signed it "Sauers" and no one then ever knew why. Bell Syndicate was a latecomer to offering toppers on their Sunday strips. For the most part they didn't start until the early 1930s, and Fontaine Fox's Toonerville Folks was one of the last holdouts. Since Toonerville Folks was one of the syndicate's big cash cows (along with Mutt and Jeff), it may be that they politely requested that Fox add a topper, and were just as politely turned down for awhile. Assuming he really did, Fox was certainly right, at least artistically, to lobby against the topper. When he finally did accede to the syndicate's wishes, it was pretty much the death of his full-page Sunday strip. 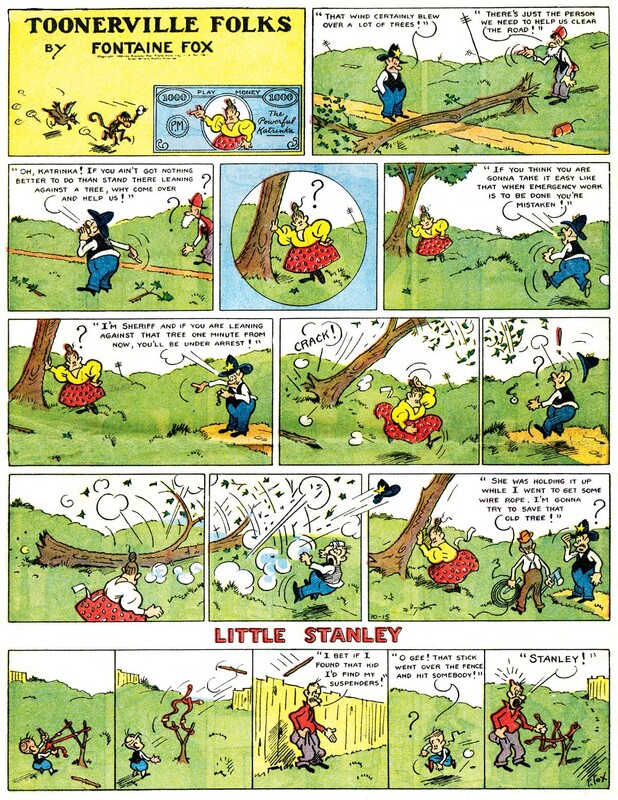 When Little Stanley debuted on April 3 1932, featuring a character who had been appearing occasionally in the daily panel since the 1920s, the Sunday Toonerville Folks was now offered in two formats -- tab page with topper, or half-page broadsheet without topper. Although it was technically possible to print a full by blowing up the tab version, as I've seen it done on occasion, I'm guessing the syndicate didn't even offer it that way, and the newspaper that was dead set on running the strip as a broadsheet full had to handle the technical aspect of that on their own. On the other hand, the new format seemed to really give the Sunday strip a boost in newspaper subscribers. So maybe Fox thought it was just dandy. Considering that I have heard rumors that Fox did not touch the Sunday, leaving it instead to his assistant Ted Clark, maybe he was pleased as punch that the full page Sunday was a goner as long as it meant nice big royalty checks. Whether Fox saw Little Stanley as a fiscal boom or an artistic bust is a question we'll probably never answer. But I do know that it didn't stick around very long. 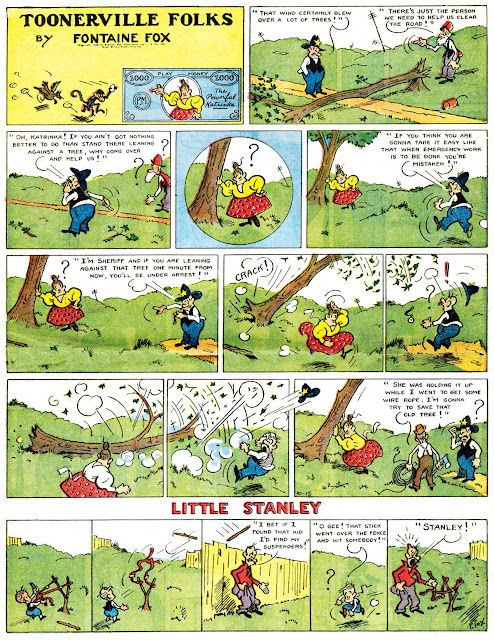 Almost exactly four years later, on April 5 1936, Little Stanley was banished. But that made no difference to the way the Sunday Toonerville Folks was offered -- it remained a half/tab offering until the World War II, when it began to be offered in third-page format as well. John G. Celardo was born in Staten Island, New York on December 27, 1918. His birthplace was reported in the Staten Island Advance, January 7, 2012. His birthdate was found in the U.S. Public Records Index, Volume 1 and 2, at Ancestry.com. In the 1920 U.S. Federal Census, he was the oldest of two sons born to Frank and Annie, both Italian emigrants. They lived in Richmond (Staten Island), New York at 37 Leyden Avenue. His father was a riveter in the shipbuilding industry. 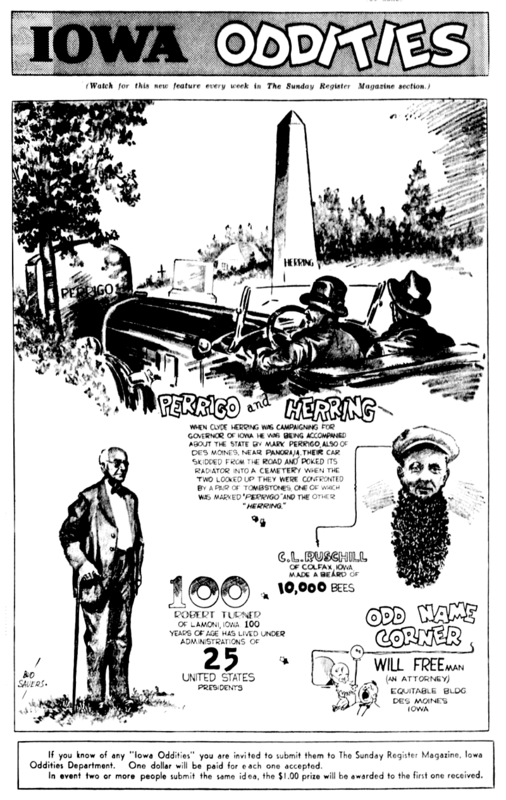 Celardo’s first professional work was doing sports cartoons and spots for Street and Smith publications in 1937. From there he graduated to comic books and worked for Eisner and Iger. When Quality Comics gathered its own staff and raided the Iger shop, Celardo was one of the artists; there he worked on Dollman, Wonder Boy, Uncle Sam, Paul Bunyan, Espionage, Hercules, Old Witch and Zero comics. He sometimes signed his work John C. Lardo. In 1940 Celardo also worked for Fiction House...There he drew Hawk, Red Comet, Powerman, Captain West and Kaanga; while after the war, from 1946-49, he rejoined Fiction and worked on the Tiger Man, Suicide Smith, and other titles. In the 1940 census, he was the oldest of five brothers, who lived with their parents at 84 Grand View Avenue. Celardo enlisted in the Army February 24, 1941. The Advance said, “He served in the U.S. Army during World War II, seeing duty in the European theater and attaining the rank of captain. After his military service, he lived in Castleton Corners, then eventually settled in Graniteville.” He had a studio according to the Manhattan Directory 1949 which had a listing: “Celardo John art studio 545 5Av MUryhil 7-529”. 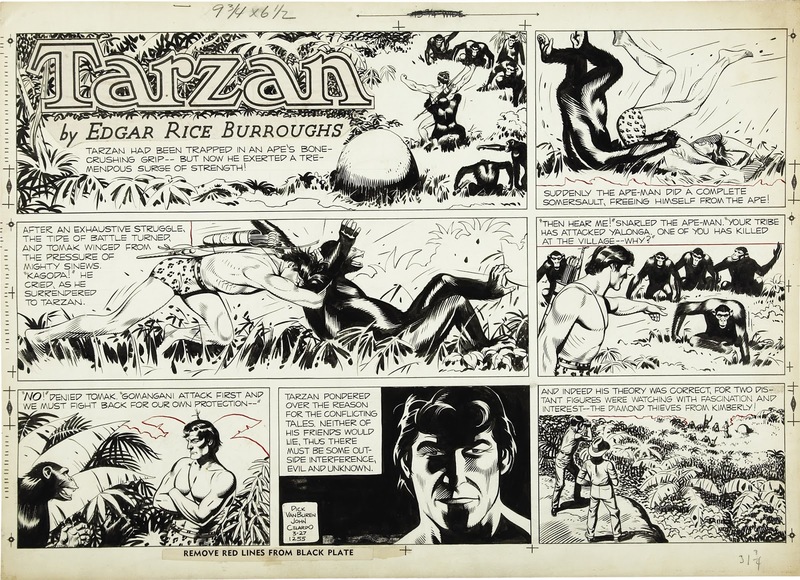 He drew the Tarzan daily from January 11, 1954 to December 9, 1967 and the Sunday pages from February 21, 1954 to January 7, 1968. He took over Joe Kubert’s Tales of the Green Beret in January 1968. Celardo passed away January 6, 2012, in Staten Island, New York. One of Jimmy Swinnerton's short-lived and swiftly forgotten efforts, Mr. Grouty starred a fellow who was always ready to fight and then paid dearly for his temper. The word "grouty", in fact, was once in the vernacular of the common man and meant, according to dictionaries that still recall that use, "bad-tempered and rude." 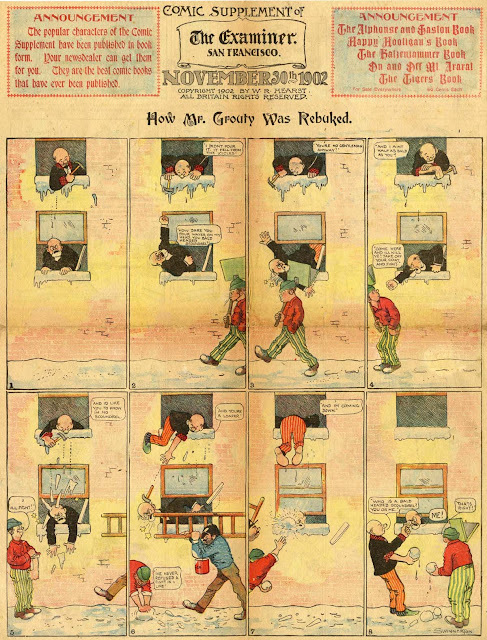 Mr. Grouty ran in Hearst comic sections from November 2 1902 to January 4 1903. Scans provided by Cole Johnson. I actually think it's kind of fun...and of course the artwork is great! 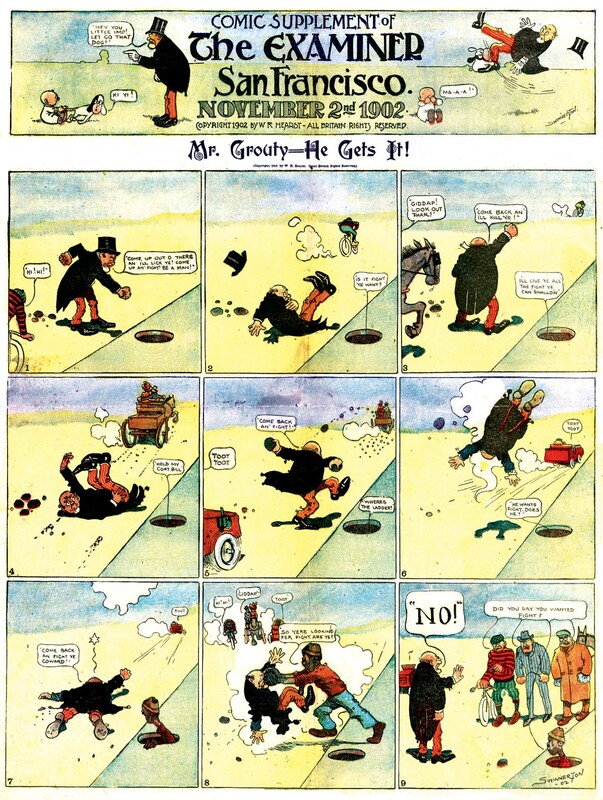 The character "Mr. Grouty", seems to have inspired "Mr. Gouty", an old goat in a wheelchair with his gouty foot all wrapped up in medical tape. "Mr. Gouty" was featured in the Porky Pig cartoon: "Porky's Hotel", directed by Bob Clampett and copyrighted Sept. 2nd, 1939. Now I understand the parody!